After a day relaxing in his apartment on the Arno River in Pisa, The Travel Bug awoke the next morning and demanded his humans take him to Florence. As they're very obedient humans, the packed him in to the car and flitted away to the capital of the region of Tuscany. These are the fascinating facts that TTB uncovered while he was crawling/flying throughout the city. TTB discovered that the photos that millions of tourists take of the Statue of Michelangelo's David located outside the Palazzo Vecchio isn't actually the real thing. The replica stands here, whilst the real statue is housed in the slightly safer venue of Galleria dell'Academia. So, basically, there are two statues of David, but only one can genuinely be called Michelangelo's. According to UNESCO, almost 1/3 of the most important works of art IN THE WORLD are located in Florence. TTB promises not to touch anything he's not supposed to as he doesn't want to get squished by an angry security guard. Or his humans before they're dragged off to jail. During World War 2, the Germans blew up every bridge in Florence, with the exception of the famous Ponte Vecchio. It is alleged that Hitler thought it far too beautiful to destroy. The Travel Bug agrees - but he thinks everything in Florence is beautiful. 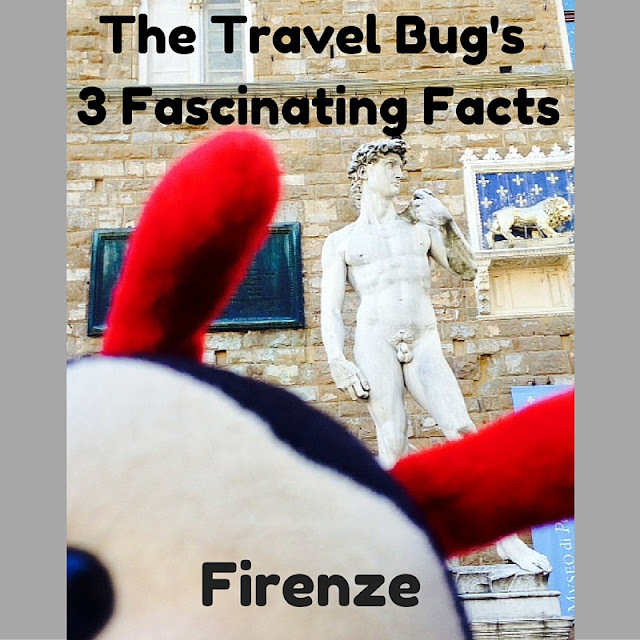 Do you have any fascinating facts about Florence to share with The Travel Bug? Visit Sightseeingshoes 's profile on Pinterest. @ Sightseeingshoes. All photos courtesy of LT . Picture Window theme. Powered by Blogger.